Since my last post I have been experimenting a lot with turning chickpea brine into different kinds of egg white based things. All these years there has been a cheap and easy alternative to eggs and egg replacers and most of us didn’t know about it. I still think this is the most amazing food and baking related thing I ever heard about. 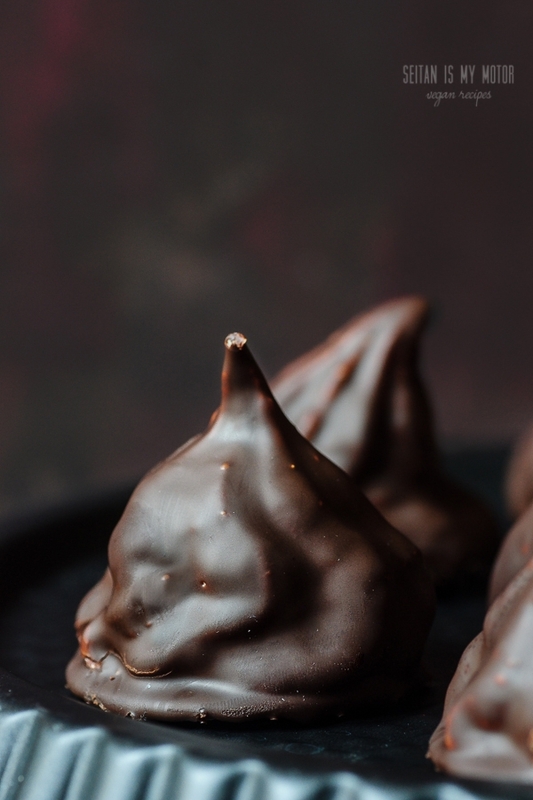 So while I was determined to come up with a vegan macaron recipe, a couple of my German readers asked for a recipe for schokokuesse (chocolate kisses). And yes, why not? A schokokuss is a pile of marshmallow fluff or soft (unbaked) meringue that sits on a thin wafer and is covered in chocolate. 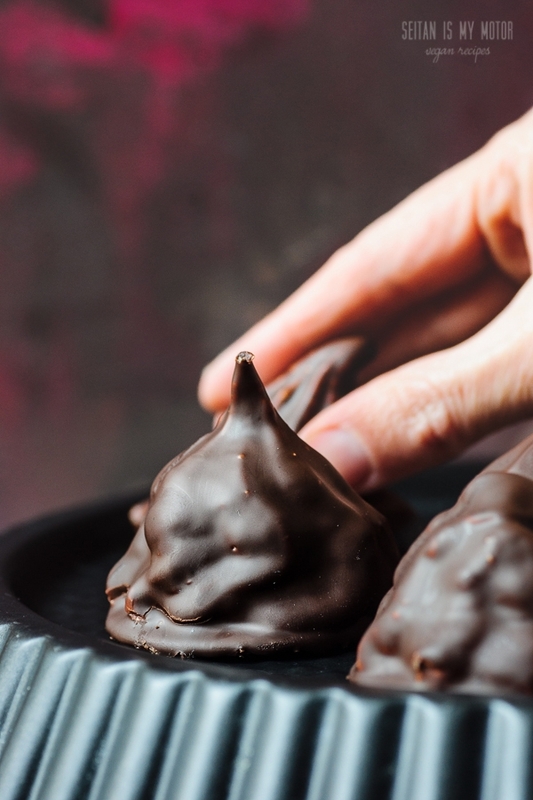 They are similar to mallomars, but taller, looking like a bowler hat without the rim. In Denmark a very similar treat is called flødeboller (cream buns). 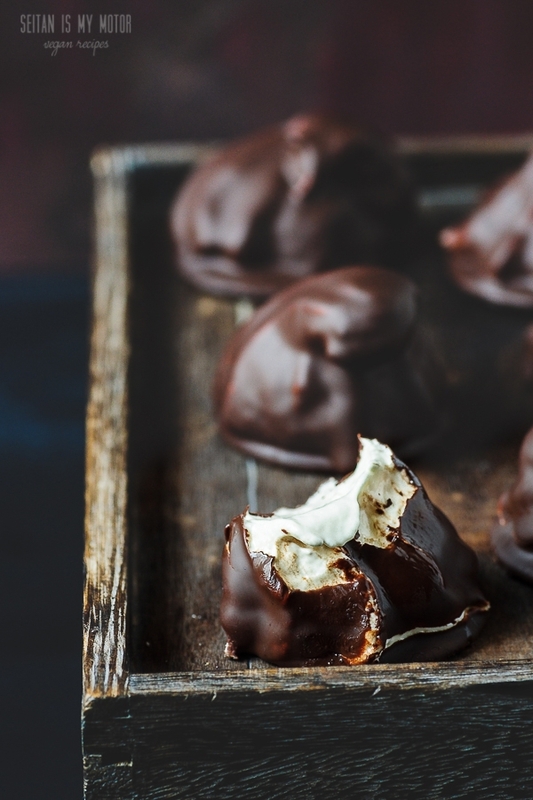 The meringue or marshmallow fluff is piped onto a cookie or a disk of marzipan and then covered in chocolate. In Germany schokokuesse are very popular for children’s birthday parties, where they are used for eating contests: The kids are not allowed to use their hands while eating a schokokuss and the person who eats the fastest wins. The best part of this being the kid’s pictures, of course. If you have never had a schokokuss or a flødebolle I must warn you though. When I ate one yesterday I was remembered how sweet and rich they are. Even though I have a massive sweet tooth I can’t eat more than one at a time. That’s why I decided to keep the yield reasonable here. The recipe makes about 7-8 schokokuesse, which can be stored in an airtight container at room temperature for a maximum of two days. 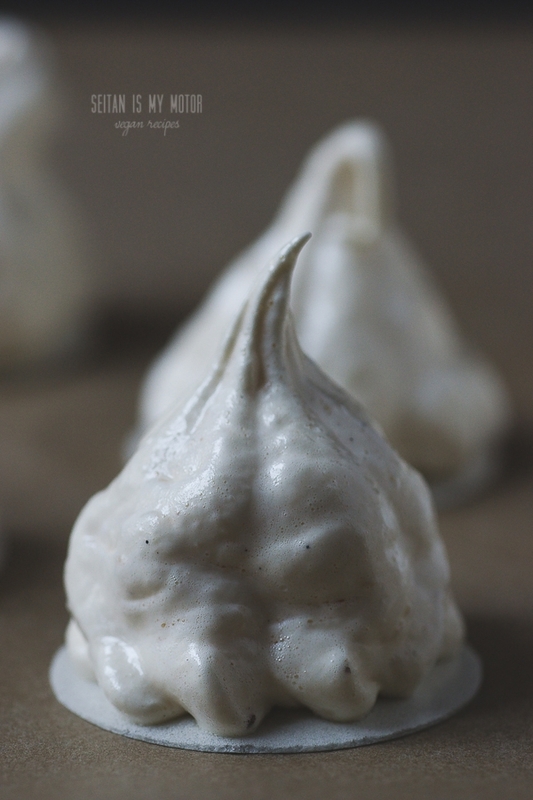 Although these meringue treats are usually made with gelatin, I based my recipe on a version that did not call for a gelling agent. It is easier this way but since I was working with chickpea brine instead of egg whites, the result wasn’t as stiff and mousse like as the omni version. They do keep their shape perfectly but the texture of these vegan schokokuesse is a bit softer. It’s like whipped cream that is not perfectly stiff yet. To me it was close enough though, especially because they taste exactly like an egg white and gelatin based version – as far as I can remember. And F can confirm that these treats are perfect for any kind of birthday party eating contest: “Mum, if you eat this, the filling squeezes out and it’s all over your face!” Yup, quite true. A couple of notes: Usually schokokuesse are made with thin round wafers. I didn’t have those on hand, so I used baking wafers with a diameter of 50 mm. If you cannot find those, you can use any kind of thin wafer or cookie as an alternative. This recipe uses hot sugar syrup that is poured into the chickpea meringue. Use heatproof equipment (bowl and whisk attachments) and work very carefully so that you don’t burn yourself. I used a handheld mixer for this but if you have a stand mixer, go for it, it’s probably better. To make the filling, combine chickpea brine and guar gum in a tall and narrow heatproof bowl and whip with a handheld blender for 2 minutes. Add cream of tartar or lemon juice and vanilla and whip for another 5 minutes or until them mixture is very stiff. Briefly whip the chickpea mixture up again. Whip until everything is well combined. Place 7-8 baking wafers or thin cookies (about 50 mm in diameter) on a piece of parchment paper. To make the chocolate coating, finely chop the chocolate. Combine with the coconut oil and melt in a water bath. Use a spoon to pour the chocolate over the marshmallow treats. Make sure not to miss a spot. Let rest for 5 minutes then use a dipping fork or a very thin spatula to transfer to a cookie rack. Move every 10 minutes or so so that the chocolate doesn't stick to the rack. Let dry completely. P.S. Charis from Floral Frosting came up with an amazing looking recipe for vegan macarons. Check it out here! These look amazing Mihl. They remind me of a well-known treat here sold in Marks &Spencer called “Walnut Whips”. Definitely the same concept just topped with a half walnut. My Dad used to love them!